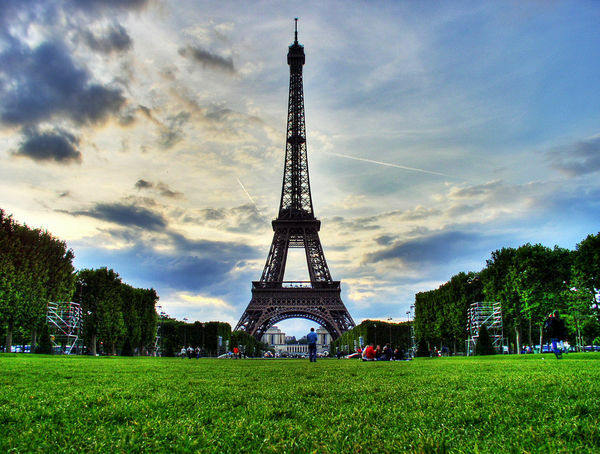 Referred to as the city of love, fashion, literary paradise–Paris, the cosmopolitan capital of France is the most visited destination on earth with about 45 million tourists visiting annually. Paris, better known as the City of light has countless numbers of iconic landmarks like museums, finest art galleries, spectacular historic buildings with fantastic architectural sense, monuments, operas, concert halls, etc. The Eiffel Tower, the Arc de Triomphe, the Notre Dame Cathedral, the Louvre Museum, Lido, Moulin Rouge and neoclassic Haussmannian boulevards are included amongst the most interesting places to visit in Paris. The most recognizable landmark of the city’s skyline-the Eiffel Tower was built by Gaustave Eiffel in the year 1889 and weighs about 7000 tons. But its spectacular view has the power and the magic to mesmerize every visitor making them forget about these facts and figures. No other monument can symbolize Paris in a better way. Musse de Louvre is the world’s largest museum, overwhelming in its size. Consisting of paintings, drawings, sculptures, antiquities, coins, furniture; this museum represents the world’s greatest art collection as well. Though most visitors come to have a view of the famous Leanardo da Vinci’s Mona Lisa & the statue of Venus de Milo, the inner walls of the entire museum are lined up by masterpieces. Musee d’ Orsay; the magnificent museum is definitely worth a visit and it is one of the greatest attraction of Paris. This beautiful museum has an impressive collection of both Impressionist and post Impressionist paintings by Pissaro, Sisley, Degas & Vincent Van Gogh. Without experiencing and exploring the gorgeous interior decorative patterns, marvelous stained glass panels separated by narrowest columns, dark spiral stairs one will keep on wandering why Saint Chapelle had been described as the ‘gateway to heaven’ in the middle ages. The other places to visit in Paris includes Musse Picasso, representing the largest collection of works by Picasso in the world, Musse Rodin, an eighteen century mansion surrounded by a beautiful garden, etc. One can enjoy immensely by walking through the streets of Rue Mouffetard, listening to the hum of the venders or by having delicious chocolate flavoured ice-creams. Especially on Saturdays this place turns into a huge market filled with artisan bakers and gourmet sweet shops. Theatre du Lucernaire is a hub of French culture with a number of cost free attractions, café hangouts and photography exhibitions. Paris trip would be incomplete without visiting Jardin des Tuileries; the historic park between the Louvre and Place de la Concorde. La Promanade Plantee is also a place to visit in Paris. It is a charming 4.5km pathway; rather a railway track with a floral makeover that runs through most of the 12th arrondissement and can join it from Avenue Daumesnil near the Bastille metro stop. It offers superb views of the lush green archways high above the city crowds. This entry was posted in Basic Travel Tips for Travelers to Paris and tagged arc de triomphe, Eiffel Tower, leanardo da vinci, Musse de Louvre, Musse Picasso, Notre Dame Cathedral, Paris trip, places to visit in Paris, saint chapelle, Theatre du Lucernaire. Bookmark the permalink.